After I finish my 1813 Prussian expansion, it is on to starting a British Napoleonic army for the first time since my original armies of pre-painted Ochel flats of the 1960's. Roughly 11 years ago, along with his 1813 Prussian infantry, I bought Jamie's small collection of (painted) 25mm British Minifigs for $1/figure - hard to beat that! The Prussians were pressed into service almost immediately, but I really hadn't touched the British at all since I bought them. Originally organized by Jamie for Column, Line, and Square, there were two Regiments, the 3rd Line (The Buffs - buff facings -, of course), and the 69th Line (South Lincolnshire -green facings). With CLS organization, that meant that each Regiment was composed of 2 flank companies of three figures each, 8 center companies of three each, a "Command Stand" of three each, plus a mounted colonel. The 3rd Infantry, aka "The Buffs"; the light company is on the near side of the front rank, the grenadiers on the far side. The drummer wears reversed colors - Hurrah! Even the drum is in the facing color with red rims. Evidently, the body of the drum was often painted with the regimental crest and/or battle honors as well - even in 25mm, not too easy to paint that on! I have read that British regiments with Buff facings ordinarily wore buff pants and/or even buff colored belts. I am unsure of the accuracy of this information however, so I chose to leave them as painted. The wonderful designs of the Regimental Colors are another attraction of British Napoleonic units in miniature! I used the surplus 15 figures plus the mounted colonel to make a second buff coated regiment; now if I can just find some old Minifigs British command packs! I made thes second unity the 61st Infantry aka "South Gloucestershire" Regiment. Chosen strictly because it also wore buff facings with silver buttons! The officer's saddle is in the (buff) facing color with edging in the button color (silver). Hard to beat the British army for military bling, eh? This is the second of Jamie's two units, the 69th, aka the "South Lincolnshire" Regiment. The green facings of this unit don't contrast quite as dramatically as the buff of the preceding two units. Jamie did a fine job of painting these figures back ? 20+ years ago! The green field of the Regimental colors looks great. Once again I have pressed the mounted colonel into service as the 6th stand of a second unit (I "borrowed" a stand from the first(69th) Regiment to complete the Square formation for this shot, though). Once again, I love the green saddle blanket trimmed in gold on the Colonel's horse! They look ready to hold the ridge line at Waterloo against the charges of the French Cuirassiers, don't they? I made this regiment the 19th aka "1st Yorkshire", as once again it shares green facings and yellow metal buttons with the 69th! I figured that while I am attending Historicon in a few weeks, I'd take good advantage of my Old Glory Army card, and pick up an order there to start on some of my own British units to paint. Unlike the above units, which are in the later "Belgic" shako, I decided to do my units in the earlier "stovepipe" shakos which were worn through at least 1812, and probably well after that in many if not most units. OG makes these in three different poses: March Attack, Advancing, and Defending. I already have a unit each of Essex Light Dragoons and Hussars to paint, plus about 16 Minifigs Heavy Dragoons from Jamie, so I most need some more Infantry and some Artillery units. Eventually, I'll have to figure out how all of this will coordinate with plans for Waterloo in 2015 (Joe has been working on painting units for Quatre Bras for 2015 for quite a few years now, using the magnificent Perry miniatures). That comes to $240, but with the magic of the 40% Army Card discount, $96 is knocked off for a final cost of just $144 for 200 figures. Hard to beat that for value! I will also need at least one unit of Rifles (? w/ command) = enough for 1 unit of 12 and one of 18. I could get Perry miniatures instead. Hmmm. Highlanders are a bit of a problem - with OG, I would need separate bags for command, center, and flank companies - thus it might be best to buy from another manufacturer, as I only want one or at most 2 units. Once again, Perry might come in handy here (and they come in packs of 6). Planning armies is a good part of the fun of our hobby, isn't it? Last month I covered the background for developing my "based upon the Battle of Dresden, 1813" scenario. It did seem to me that the number of Allied troops was rather high. On re-reading my source materials, I discovered that part of the reason for that was that only a small part of Klenau's corps ever made it to the battlefield. Eliminating the surplus Austrian troops reduced the imbalance in the forces considerably. I also left out Teste's small Division on the French side. so adding a few more infantry units there helped, too. It took me much longer than I expected to put this one together, especially having done it once before with Grand Piquet. Work demands, an annoying cold, and the approaching wedding of The Princess Imperial in August all combined to delay the project considerably! The basic idea behind adapting the scenario is to have 5 commands on the Allied side - 2 Austrian, 1 Russian, 1 Prussian, and the Allied reserves. This involved chiefly increasing the number of Russian troops and decreasing the numbers of the Austrians, and reshuffling some Russian troops from the reserves. On the French side, the Dresden Garrison is added to some of the French line corps, and the Imperial Guard troops shuffled around a bit (and I have substituted the Wurttemburg Guides for the Berg Lancers, which i don't have. Thus purists should work off the earlier OOB (with the above corrections) and not this one! This scenario was developed for use with Field of Battle, 2nd edition, by Brent Oman. A description of the rules is found here on this blog. See the prior post for the troop and ground scale, etc. Heavy Rain - all Infantry Fire is Down 2, Infantry and Artillery are Down 1 in melee. Infantry in buildings (but not the Gross Garten) are exempt from the above penalties. While the Austrians had the bulk of the troops and Schwarzenberg was acting as Army Commander, the presence of both Czar Alexander and King Frederick-Wilhelm on the battlefield meant that Allied generals that disagreed with order from Army HQ could and did feel free to appeal to their sovereign to over-ride them. To reflect this, on each Allied Leadership Card, roll a D6; on a 1,2, or 3, Schwarzenberg is in command; on a 4,5,6 The Sovereigns have effectively taken command - use the appropriate Leadership Die type (D10 for Schwarzenberg, D8 for the Sovereigns) until the next Allied Leadership card is turned. The Allies use an Average Sequence Deck. Napoleon was clearly the best general on the field this day. While I have assigned them to Corps for game purposes, Murat functioned as Left Wing Commander, and Ney as Right Wing commander, and they seemed to function fairly well in these roles. Napoleon gets the D12+1 LD rating and a Superior Sequence Deck. In addition, Napoleon gets 10 Morale Points as a "reserve". He can transfer any or all of these to any command(s) of his choice on each French Leadership card. On each appearance of the friendly Army Morale Check Card, any Corps with zero Morale points must check Morale as per the Army Morale Check rules. If they fail, they will start retreating towards and off their nearest friendly baseline at full speed at the next available opportunity, and may not initiate melee or regain Morale Points. All units in the Corps are permanently Out of Command, and any units that were Out of Command at the time the check was failed are removed from play immediately. If the side turning the Army Morale Check card then has more Corps that have failed Corps Morale than the enemy, then a standard Army Morale Check roll must then be made for that army. The Weisseritz is unfordable, and can only be crossed at the bridge at Plauen, or, for the French, at the Bridges in Dresden. To use the bridges, a Command must use one Move one segment off the table (exiting within 8" of the point where the Weisseritz runs of the table towards the Elbe), and and then another Move segment back onto the table, returning withing 8" of the same point (on the other side of the river, of course). The other streams are all Class II terrain. The Buildings are all Class II Terrain, except the Gross Garten which is Class III. All the Hills are class II terrain as is the woods. Monday Knight Productions released the last of it "Fleet Books"/Rules expansions last month in a stealth fashion worthy of the cloaking devices employed by the original Superior Starfleet Wars rules version of the Aquarian ships. After a brief debate, of, maybe a minute, I decided that I would get a copy to complete my set, even though the Aquarians are the one fleet I *don't* have.... although Joe (Fishtales blog) has a boatload, er, well a shipload of them! At the same time, I decided that I liked what I have seen and played of the Galactic Knights rules enough to get a 2" hex grid star field table cloth for use with them, so I picked up the largest (6 x 4 feet) one they sell at the same time. Available from Monday Knight Productions, $10 for CD-rom version, $15 for print, or $20 for both! Certainly a reasonable price; no pdf version as far as I know. The book is a fairly slim 30 pages with a plastic spine binding, of which almost half is the ship charts for the new "standard" designs for the Aquarian ships sold by MKP - 12 ship types in all, with 2 variants for the Aquarian Starbomber (for two very different roles). 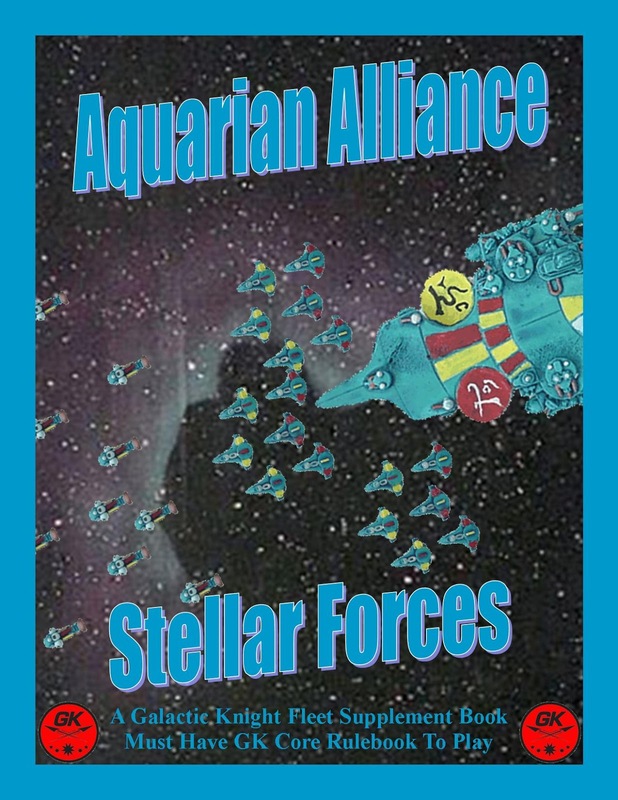 There are roughly two pages of rather thinly done "fluff" introducing the Aquarians and their place in the Known Galaxy, including what is known of their origins, biology, philosophy, and political stance. Barely adequate, I would say - the Superior materials, although hardly extensive, were better done, I think. But at the end of the day, fluff is, well - fluff! You can very easily develop your own to replace/modify/augment the "official" version. The background does explain the Aquarian philosophy,. which is more to cripple their opponents than destroy them, and their relatively neutral stance in relation to the other star-faring species. This is facilitated by their limited colonization, settling only worlds that are entirely water covered, and thus inherently of low interest to other species, and difficult for them to hold should they succeed in conquering an Aquarian world. The Alliance is rather loosely organized, at times making its actions and motivations even more opaque to other species. Finally, the Aquarians are the most technologically advanced of all the fleets. Those familiar with the Starfleet Wars version of the Aquarian ships will want to know first if the cloaking device from those rules appears in the GK version. As I had expected, the answer is "no. Implementing this in game terms was challenging in Starfleet Wars, and would be at least as challenging in Galactic Knights. Thus, I think the authors made the right choice on that one, as cool as it was. That being said, what new goodies do the Aquarians have access to? First is their "nannite techonology" armor. This armor is limited in amount,and must be equal on all sides of the ship. The nannite technology allows the Aquarians to "shift" the damaged sections of armor to any side(s) of the ship of their choice during the "drift" phase of each turn, subject to limitations based upon the size of the ship (bigger ships can shift more, smaller ships less). Assuming you anticipate the upcoming threats reasonably accurately. this greatly increases the efficiency of the armor. The "shifting" of damaged sections seems like it might get a bit fiddly in game terms, but I imagined that play testing showed that allowing the armor to function such that it screened all directions within a given layer was too powerful an advantage. The Nannite armor limits Aquarian ships to no more than one shield generator regardless of the size of the ship. Second, Aquarian vessels mount a new kind of weapon, "Pulse Cannons". These are designed to strip off the outer layers of armor and weapon systems from the target, rather than penetrating deep into the critical systems. Thus, hits scored by Pulse cannons are marked off horizontally rather than vertically. Third, Aquarians employ a unique kind of missile, the Harpoon. These missiles do not destroy the target, rather they orbit it and emit a dampening field around the target that impairs the effected ships outgoing fire. The effect increases as more Harpoons are present. this is particularly annoying for large, powerful enemy ships! Finally, the Aquarians have one minor wrinkle on fighter bay. Unlike other species, their fighter bays can be located deep within the ship, not just in the surface layer. Fighters exit from such burring bays via Launch tubes in the surface layer. his increases the "survivability" of Aquarian fighters after a battle compared with other species. That's pretty much it; nothing really revolutionary, but enough to give the Aquarians their own special flavor and tactics. I look forward to trying them out on the tabletop... even though I still have plenty of other systems/species to try out as well. In other news, next the folks at MKP are considering developing rules for their space stations (yay! ), and possibly a scenario and or campaign book(s) (whoopee!). As related in "Singin' the Prussian Blues", I have these 16 Minifigs casting of the Prussian Foot Guards in Full Dress for almost 10 years. With the Battle of Dresden on tap for next month at Historicon being one of the actions where they took the field, it was finally time to put some paint to the lead! For some reason, the Krylon white spray primer that I always use went on rather granular (it was the end of the can, maybe that was a factor? ),and that plus the clean line of the castings made me decide that I would not use the "magic wash" on these figures, and that shading would be limited to the plumes, faces, and hands. I also decide for these "parade ground" uniforms, I would apply the Prussian Blue full strength and un-thinned; indeed, due to the somewhat granular priming, many parts of the jackets got TWO coats of Prussian Blue. This is a much darker looking shade than the thinned version I have used on my other Prussians. Although not worn in the field, who can resist the magnificent Busch plumes that the Guard wore for Parade dress? Surely not an aficionado of military bling such as I! The stand on the far right of the picture has black belting, thus representing the Fusiliers of the Regiment. The standard (from Warflag) is that of the 1st battalion, with the rather unique blue grey background to the central Prussian Eagle motif (usually seen in orange). The base of the officers plumes is black, with the iother 80-90% white. The Drummers have a red Busch, as well as red and white shioulder wings. 2 spots are left for future additional acquisitions to bring the unit to a full 18 figures! Only 12 figures per unit are needed for my convention Field of Battle games, however. I under coated the red collars, cuffs, and turnbacks with white so that the bright red would really "pop" out. In this picture you cab see the guard lace on the collars and cuffs; with out the plumes and with the Guard stars on the shako covered, the Litzen would be one of the few ways to tell that a Prussian unit belonged to the Guard. In the reorganization of the Prussian Army that followed the debacle of 1806 and the treaty of Tilsit in 1807, the Garde Regiment zu Fuss was originally numbered as the 8th Infantry regiment. A Garde-Jager battalion was also part of the post 18108 establishment. To make things confusing, in June 1813, this regiment was taken out of the Line sequence, and re-designated the Erstes (First) Garde-Regiment zu Fuss. Simultaneously, the Zweites Garde Regiment zu Fuss was created from the Normal Infantry Battalion, the 1 st Battalion of the Colberg Regiment, and the Leib-Fusilier Battalion. The second regiment wore the same uniform as the first, except that the style of the cuffs was different, and yellow metal buttons and Litzen replaced the white of the 1st regiment. As a results, the old Line Regiments 9 - 11 were all moved down one number and a new 12th (Brandenburg) Regiment was raised from reservists. In 1814, a new Garde-Schuetzen battalion was raised. Also in 1814, the six independent Grenadier battalions were regrouped inr the newly designated Guard Grenadier Regiments, which were #1 "Czar Alexander" and #2 "Kaiser Franz". Wer eine wahre Preußischen Herz hat , folgen Sie mir! About the same time that I started my Residency (1981), a new set of wargames rules was released that really sparked some reconsideration of my approach to the subject. With a nominal figure scale of 1:100, Ned argued in favor of using the regiment as the basic tabletop unit. This would translate to infantry units ranging from about 12 to 24 infantry, and 4 to 12 cavalry.. Although written with 15mm figures in mind, for 25 mm figures, basing was to be 15mm frontage for infantry (20mm for British and other 2 rank infantry), 35mm for Cavalry, and 10mm per gun in a battery. Ground scale for 25's was 1mm = 2 meters, in other words, effectively 1" = 50m. As a result, again in 25mm terms, that set musket fire range at 10 cm and Rifle fire at abut 14cm, :, with Artillery ranges at 14cm for "effective", 30 cm for "average", 44 cm for "long" and 60 cm for "far" range. Movement was divided into "Full Moves", which were every rigid and allowed neither changes of facing, formation, nor reaction to the enemy, and combat moves, which were half the distance of Full moves, but did allow the above niceties of response and maneuver strategic conversion, there was also a Triple Move, representing units string out in Road column and moving over greater distances. A turn was sent to represent about 30 minutes of battlefield time. The rules tracked combat effectiveness by "status points":, which, along with the figure strength of the unit and the other usual modifiers, were the key determinants of combat and losses. Vive L' Empereur also included extensive designer's notes (8 pages), explaining Ned's thinking. I love it when rules authors include these kinds of notes! 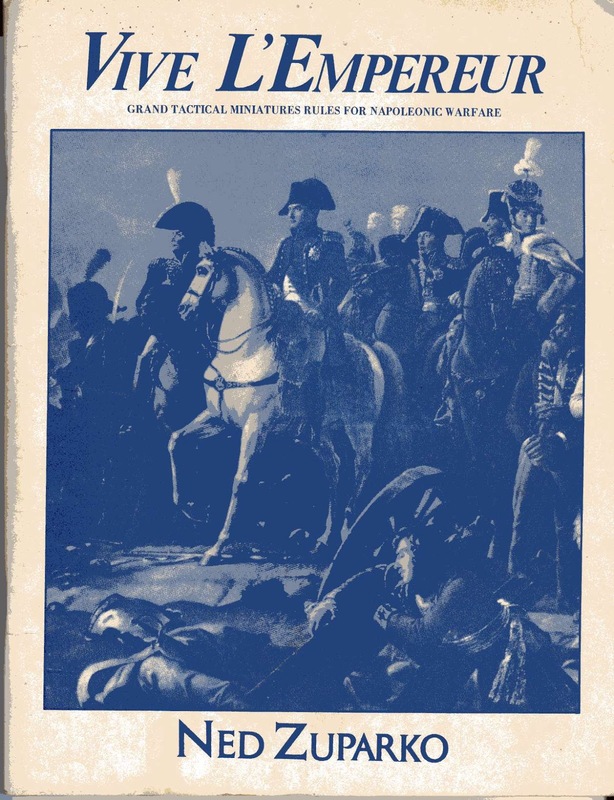 Published in 1981 by Chaosium, "Vive L' Empereur" was one of the first widely distributed sets of Napoleonic rules to use the Regiment instead of the Battalion or the Brigade as the basic tabletop unit. The Regiment, a group of men about 2,000 strong, was chosen as the basic maneuver unit. In this way a typical Corps Commander would have about 20 units to handle, a number I felt optimal for one player. he average Corps might have three Divisions of 4 [infantry] Regiments each, with a cavalry Division of 4 regiments, and 5 artillery batteries. Another reason for using Regiments and Batteries comes from an item by Clausewitz. He states that the fire of an 8 gun 6 lber Battery 'certainly does twice and possibly three times' as much execution as a Battalion. Since a 'Regiment' would contain 2 or 3 Battalions, I found that Regiments and Batteries could be considered about equal in Firepower and potential. Since the Command level being emphasized in the game is Corps, Command, it is not necessary to portray historical units at the lowest level, such as the Battalion. Once the command level gets under the Division, the the number of maneuver units we choose to have needs to be considered only in terms of how many are playable. The "Regiment" of 2,000 men in some campaigns may have been a small Brigade, but the important point is that we are working with for which there are size equivalents in most armies, even if the names are different. There is also some flexibility in portraying larger or smaller Regiments of, say, 1,500 to 3,000 men. Further, a "Regiment" can handle many of the smaller level changes that may have historically occurred. For example, an 18 figure French "Regiment" could represent three 600-man battalions in 1813, or two 900 man Battalions of 1805. The Regiment thus represents smaller units, Battalions, assumed to be operating in proximity. We are considering the Regiment as covering a certain area, representing both a body of men and the critical space around them that would involve those men in combat if entered by an enemy. We don't need to worry about lower command levels - they are being abstracted to make our chosen command level of simulation easier to use. For this reason, if any part of a Regiment touches any part of another [enemy] Regiment, we assume that both units are entirely in close combat. The author also observed that the 1:100 figure ratio made for easy conversion of Historical rosters to tabletop units, as well as keeping the size of collections needed to play the larger battles of the era at manageable levels. Ned remarked that setting the Maneuver unit as the Regiment also has the tabletop units at the same level at which most of the colorful variations in uniforms that the Napoleonic era is justly renowned for occurred. This made a lot of sense to me, and I decided that henceforth my units would represent "Regiments" of Infantry and Cavalry of 18 (6 stands of three each) and 8 figures (four stands of 2 each) respectively, and Batteries of Artillery with 2 stands of three crew (four for 12 lber batteries for ready identification on the tabletop). Finally, I'll note that an eight figure Cavalry regiment conveniently makes the 1st figure the "elite company" in French regiments! Similarly, an 18 figure Infantry regiment mounted on six stands of three figures each pretty neatly represents 2 large Austrian Battalions, 3 smaller French ones (allowing one stand each of Grenadiers and Voltigeurs, and four of Fusiliers per unit), a Prussian Regiment of 2 Musketeer and 1 Fusilier battalions (again allowing four stands of Musketeers and two of Fusiliers), and probably almost a Brigade of the habitually under strength Russian units (here I fudge a bit by having one stand of Grenadiers and five of Musketeers/Jagers). As I approach doing the British, I confess that I am debating doing them as 20 figure regiments, probably each with 4 x four man stands of "center company" men, and two 2 man "Flank company stands. However, the more I think about it the more I am inclined to do them as 18 figures like all the rest, with one of the three man stands having 2 figures of Grenadiers on the right side, and a second having two figures of Light Company on the the left end of its stand. Close enough! Hmm, time to browse the Old Glory catalog for a sizable order of British to pick up at Historicon, perhaps? !